There are a few signs of a healthy happy dog – bright and alert eyes, a wagging tail, a healthy appetite – but none or more obvious than their coat of fur. The more silky and lustrous it is, the healthier your dog is. However, while inner ailments can affect a dog’s coat, a healthy looking coat also comes from outer grooming as well. So how does one keep a healthy looking coat on their dog? Some see brushing as merely a way to deal with shedding, and yes, it does help with that. However, brushing also removes tangles, spreads natural oils, and released other particles trapped in dense fur. Brushing is something that shouldn’t be neglected as it is crucial for a healthy dog. If brushing is neglected and the dog has tangles or matted hair, they can be quite painful to the animal. The first sign of poor nutrition of a dog is a brittle, dry, thin, or otherwise a dull coat. Make sure your dog is getting a healthy and high quality diet. If your dog’s coat is looking unhealthy, you may want to find a food with higher fatty acids. Sometimes the best thing you can do for your dog is notice a problem. Be sure to give them a regular once over. 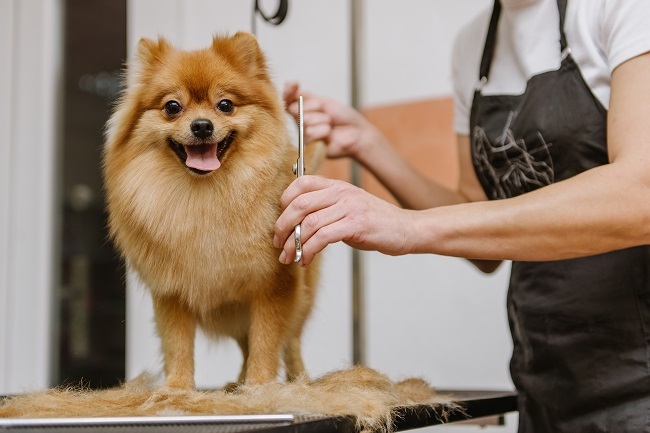 Be sure to check the armpits and other crevasses for matted fur, notice any fur that doesn’t feel quite right, and watch to see if they are scratching or flaking. Off-feeling fur and obsessive scratching may merit a trip to the vet to make sure it isn’t caused by something more serious. Regular grooming is crucial to a healthy dog. Not only do they need regular brushing, but their nails and teeth need to be regularly attended too. It is a lot of work and some dogs can be excessively difficult about it. If your dog needs grooming in the Houston area, contact us today to see what services we offer.